Three friends must level-up and become heroes when their workplace, a Los Angeles hotel, is taken hostage by evil gunmen seeking a large ransom. Game Over, Man! is a dangerous comedy from the creators of Workaholics starring Adam Devine, Anders Holm, and Blake Anderson. Official Trailer 2 • Game Over, Man! 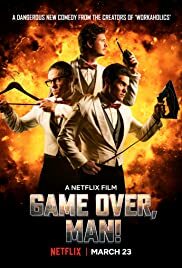 Official Trailer • Game Over, Man! Teaser Trailer • Game Over, Man!